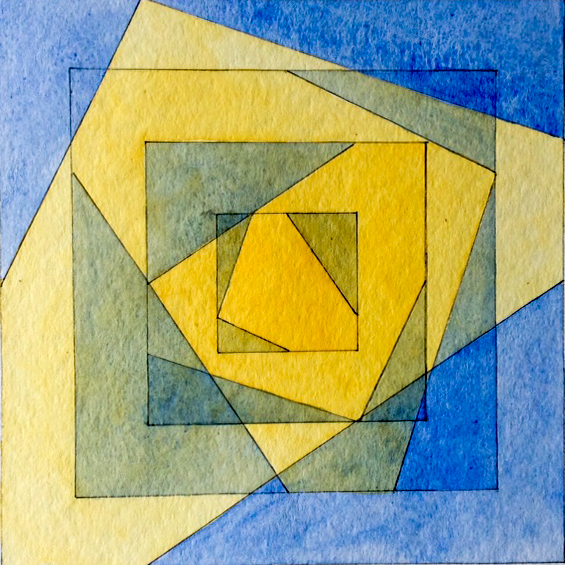 The subtracted areas are painted blue, the remaining central shapes are yellow, each square is rotated once clockwise. This is the second painting I submitted for the Summer show at the RA, the first being the portrait of of my uncle Peter. A completely different kind of painting altogether, I wanted to explore pure colour, to find the clearest, strongest ways to show its true nature and behaviour in watercolour medium. Only three colours are used, cyan, magenta and yellow, employing juxtaposition, overlay and tone as well as wet and dry paper and re-wetting techniques. Each colour is laid on individually, not mixed. 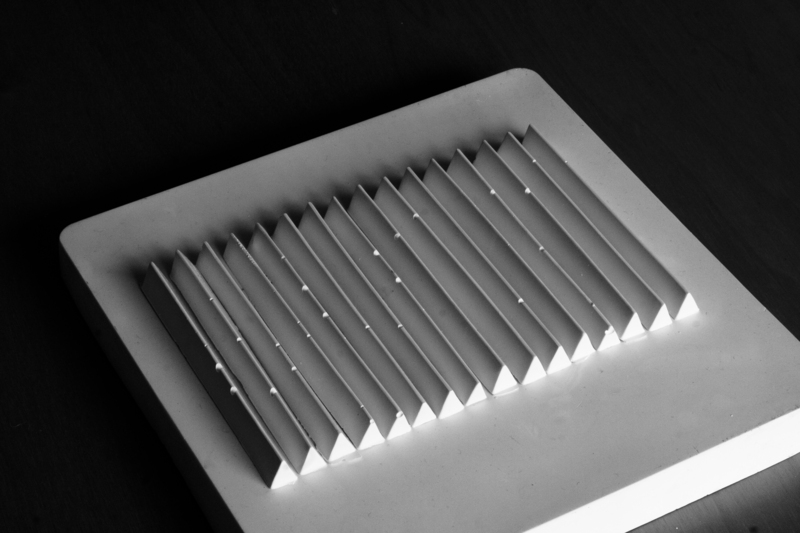 As a jeweller my work is very much about control, my designs are geometric and ordered, serendipity is a rare and welcome component, usually appearing whilst pushing the limits of the material. 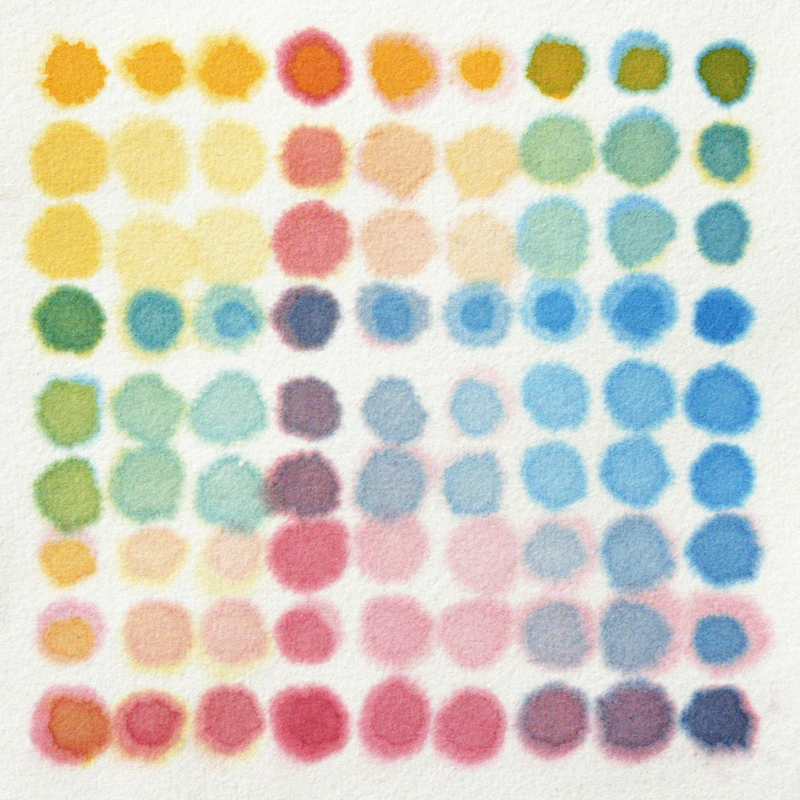 This process follows through in the “Dots” series of paintings. 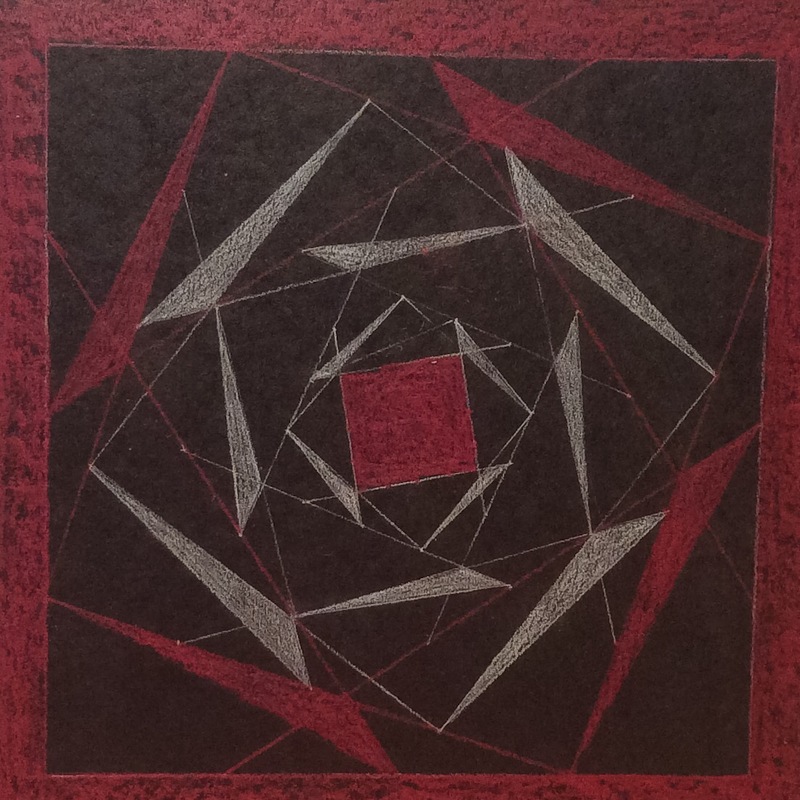 I begin from a precise positioned grid of marks, working on wet and/or dry paper, overlaying in several passes following a strict order whilst allowing accidental or material based irregularities to occur. Colours are applied with droppers or with broad washes laid over dried dots, allowing the colours to soften and run at will. 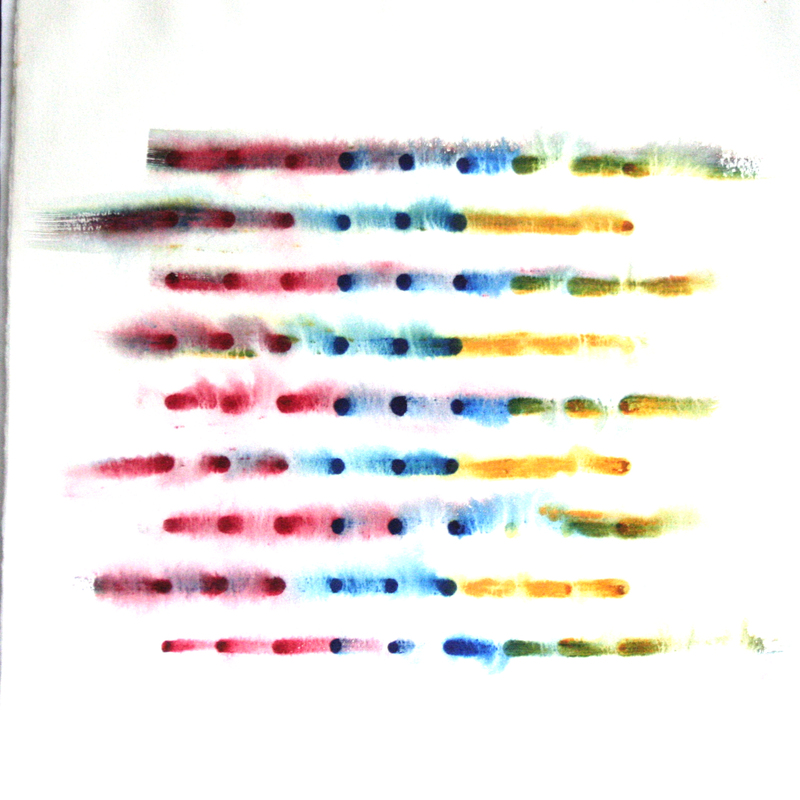 This following painting uses another technique, I laid down intense drops of colour on dry paper and allowed them to dry out completely before brushing over them with clear water and a large brush, spreading the colour and making the colours run. I had meant to post the photograph which inspired me to paint the watercolour of my uncle, who sadly I never met, or if i did meet him I was to young to be cognisant of the fact. Here in this tiny black and white poor quality print, he sits in the back of a boat perhaps somewhere off the devon coast with my mother and an unidentified relative. 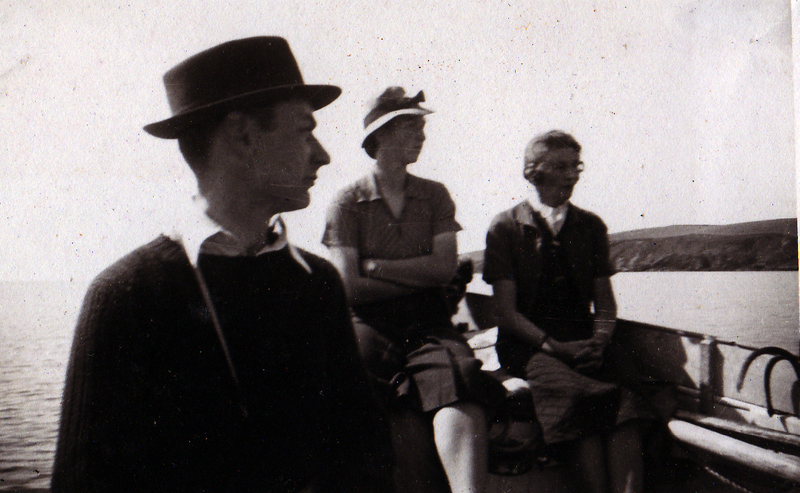 I have a tiny black and white photo of my uncle Peter in a boat on a seaside day out with my mother perhaps before the war. I don’t recall ever meeting him as he died when I was very small but this image draws me in. He was an artist and studied at the Slade in the 1930’s, even winning a couple of prizes. I think it is his profile that I like so much, the slightly weak chin and mouth and the refined but quirky nose, it curves down right at the tip a bit more than I have managed to capture here. Then there is the hat, a black trilby not a straw boater, an odd choice of headgear for a boat trip, I suppose it was all he had with him and wanted to shade his eyes. I have made very few watercolour portraits, I find the medium too challenging to accommodate the endless tiny changes I always seem to need to make before the likeness feel right. However, I have painted this now about 15 times and I have nearly got it right. 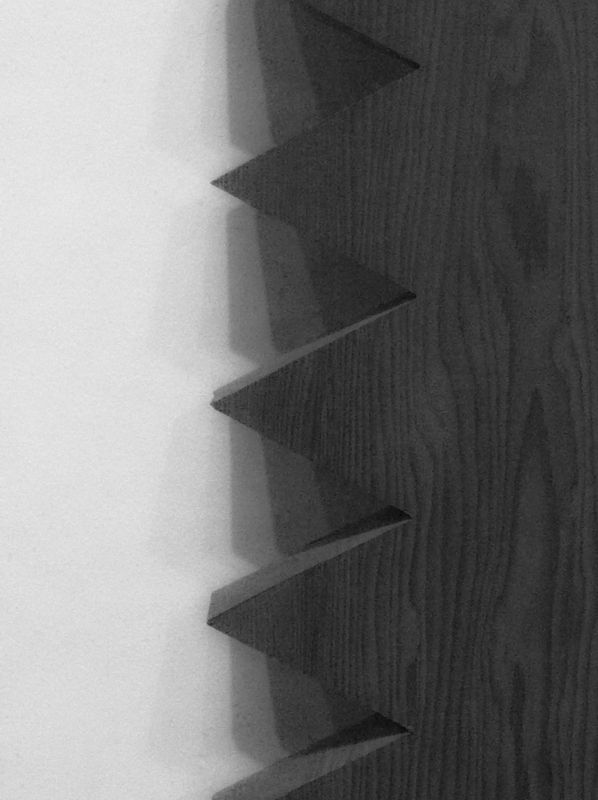 I chose to restrict the palette to just Paynes Grey as I was working from a black and white image. 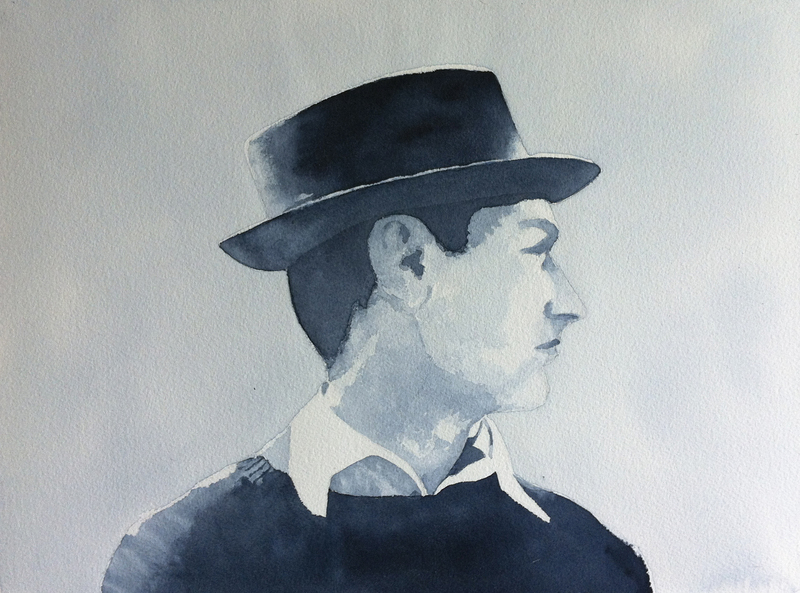 The blue/grey becomes a rich dark blue when very strong as well as keeping its colour in the faintest washes. If or when I do it again, I will paint the sky differently, I was trying to capture the way the dark hat’s edge turns white in the bright sunlight as well as the tips of brow, nose and chin disappearing into the brightness. I haven’t got that quite right here. Also there is a line of shadow along his jawline which is too harsh. I must keep trying I guess. Having now reread the information label I am pleased to discover that we had in common, not only looking at repeated regular forms but also of their inconsistencies and flaws. 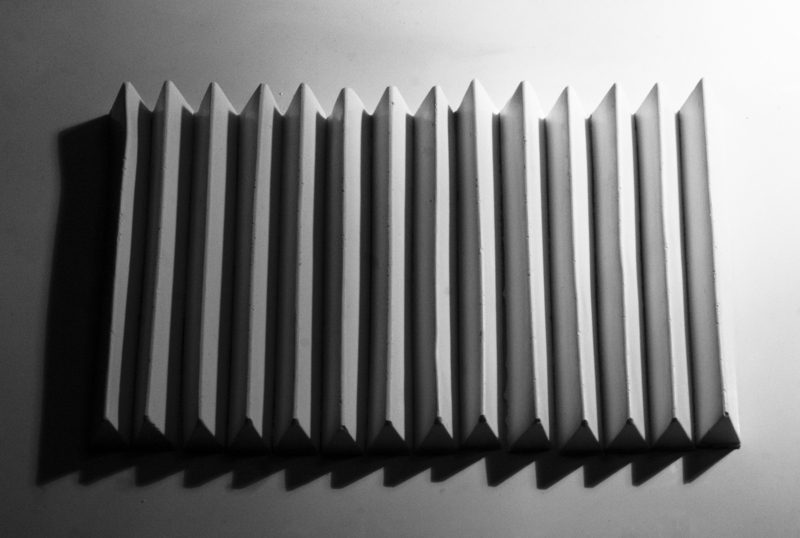 The particular reason for photographing this work was for the shadows that were being cast on the white walls by the multiple spotlights above. I can count 5 in this photo but I think there were more. Lighting my castings with several sources is something I must try. 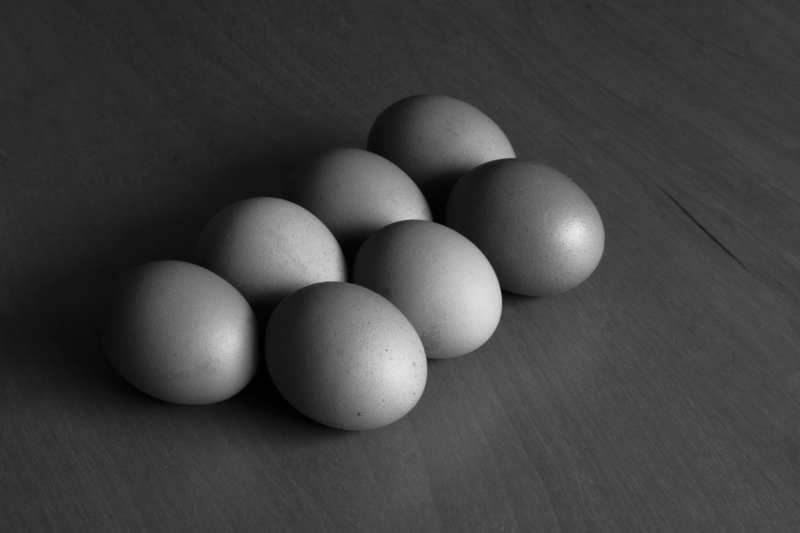 I want to explore creating shadows with eggs so I’m going to try making a mould so that all my eggs are the same shape. 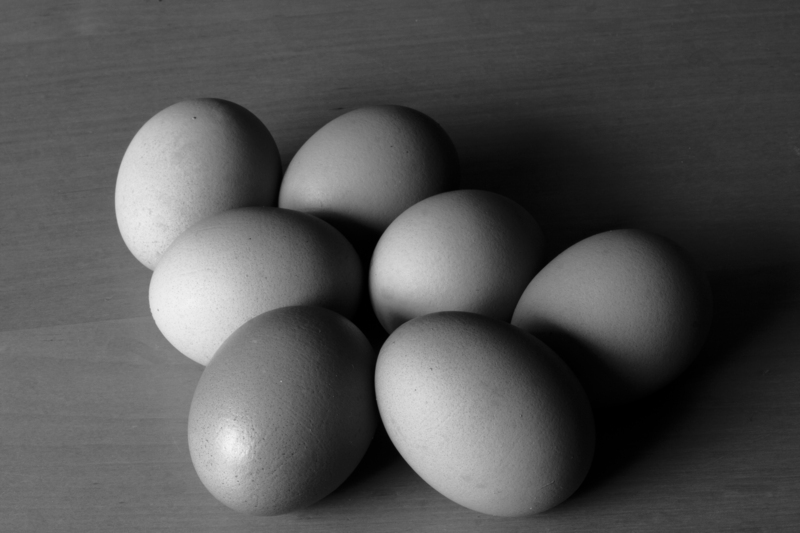 Some of these real eggs have subtle textures which I love, I don’t know if I will be able to combine areas of texture from several eggs into my mould, I hope so. I think the moulds will be half-eggs, which will make it easier to create the shadow effects I want.